This perspective gives you a view of the market and its players in order to present new business ideas and sales concepts and optimise existing ideas and concepts in an organisation. 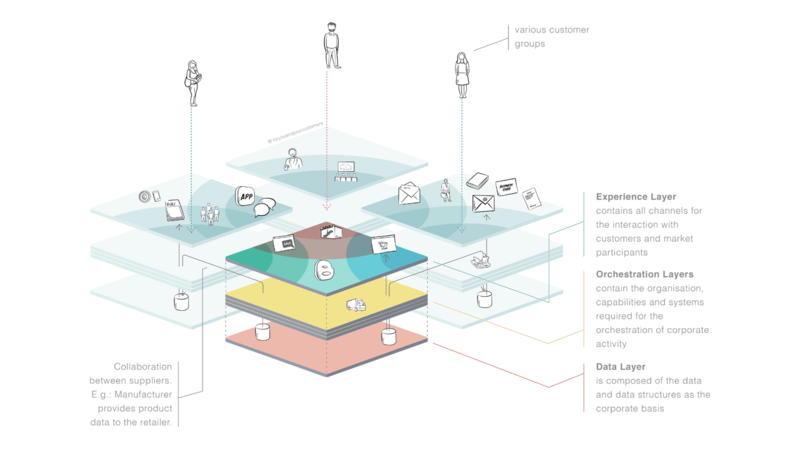 The Exploded View is an effective tool for helping companies navigate an increasingly digital world. The model is based on six levels. These levels can be broken down into different perspectives and used accordingly – these include the customer, market, company and employee perspectives. In this article, we want to shine a brief light on the market perspective and show how you can use the Exploded View to create relevant added value for your own organisation as well as your customers. You can find a detailed description of the market perspective and additional useful tools for your digitisation projects in our free white paper. 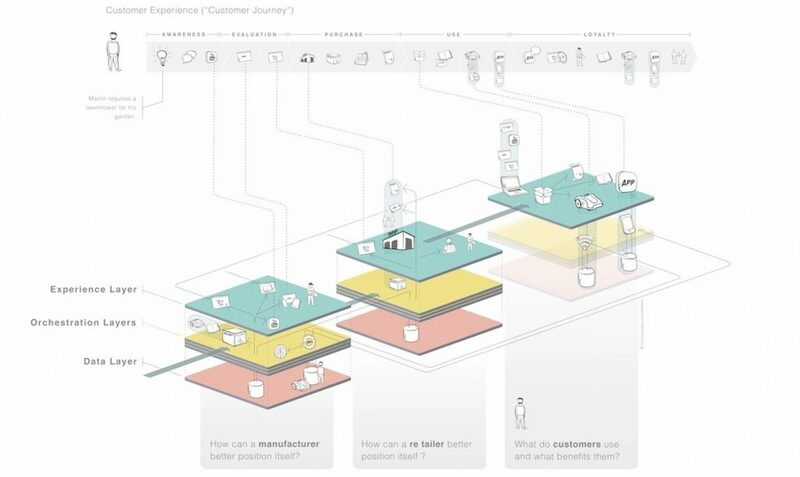 The market perspective in the Exploded View lets users consider how the market and customer behaviour interact. This overview simplifies the process of planning and resolving the company’s options concerning their customers and business partners. Therefore, this area of the Exploded View is frequently described as the strategic perspective. The uppermost layer of the company, the experience layer, represents the interface and, therefore, the experiences of customers and the market. The lowest layer, the data layer, is the foundation level and represents the data and data structures as an entrepreneurial basis. Between experience and data, the three layers of organisation, performance and assets are grouped and combined; they are referred to as ‘orchestration layers’, as they orchestrate how the company does business. The customers are shown floating above the company’s layers. Unlike in the customer perspective, they no longer represent a specific person; rather, each of them symbolises a customer group that experiences the market. Companies can strategise and plan their own positioning in the market. Ultimately, though, the customer’s overall experience across all channels and market players, including their experience with the real and the digital product, will be the factor that truly counts. By increasing the connection of market players across different levels, customer loyalty and therefore the market position can be improved. The overall experience and hence the perceived positioning can be modelled as the sum of all lines between a company, the other market players and the customers (see illustration). The interaction and resulting customer loyalty rises proportionately with the number of lines that connect a company with its customers (e.g. dealers or consumers) on various levels. This is why all lines must be considered in efforts to improve the market position. An organisation can use this perspective of the market and the other market players to model current and new business ideas and sales concepts, as well as to outline, check and optimise the intensity of customer relationships. The Exploded View model has been tried and tested many times and can help you by offering an overview, structure and guidance for overcoming the challenges you face in your digitisation process.